Yay! Spring Break! That special time to be sequestered with adolescents and/or pre-adolescents in about 50 square feet while hurtling down the highway at 70 m.p.h. And so it goes, that wonderful non sequitur called family time. School had a noon dismissal on the Friday preceding spring break. Our ultimate destination was Cumberland Island National Seashore but we thought we would take advantage of the early dismissal and breakup the six to seven hour drive. We decided to drive just beyond Columbia, Sc. and take a short side trip to Congaree National Park. It was a wonderful decision. Congaree is about 26,000 acres of bottomland hardwood floodplain adjacent to the Congaree and Wateree Rivers. 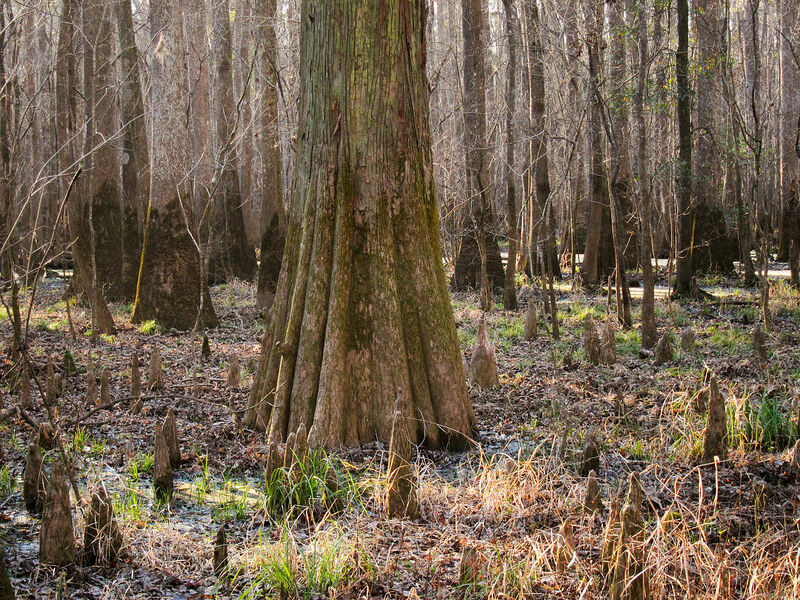 More than 11,000 acres of Congaree are classified as old growth – make that tall old growth. Sometimes characterized as the tallest bottomland hardwood forest on the planet, Congaree is home to 15 “tallest” species records – they include a 167-foot tall loblolly pine, 157-foot sweetgum, 154-foot cherrybark oak, 135-foot American elm, 133-foot chestnut oak, 131-foot overcup oak, a possum-dizzying 127-foot persimmon and a 125-foot laurel oak. The park is home to 81 species of trees. We didn’t have time for an extended trek in the park, but that was okay because the wonder begins as soon as one walks into the forest. We did a loop, between 2 and 3 miles, starting and ending at the Harry Hampton Visitor Center. Part of the hike was on boardwalks through the swamp and part on a sandy/loamy trail through the woods. Hundred-foot tall loblolly pines were within a stone’s throw of the visitor center and before we knew it we were among large bald cypresses – their knees surrounding them like an army of minions – and big-buttressed tupelo gums were rising from the frequently flooded earth, my Loosiana soul was glowing, I was home. And if I needed any convincing, the cottonmouth we saw cruising up Weston Lake, riding high in the water, fat triangular head raised, tongue flicking, checking out it’s surroundings sealed the deal. In a couple of weeks before returning to the Nantahala and Pisgah national forests we will look at another unique forest type – the maritime forest of Cumberland Island National Seashore. 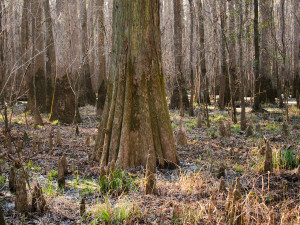 Great story, and for those ‘who have ears, let them hear’ Congaree NP has been next on my list, but has moved up since then !